Well it seems the last time I updated here was early January…not sure where Feb, March and April went?! Where does the time go? 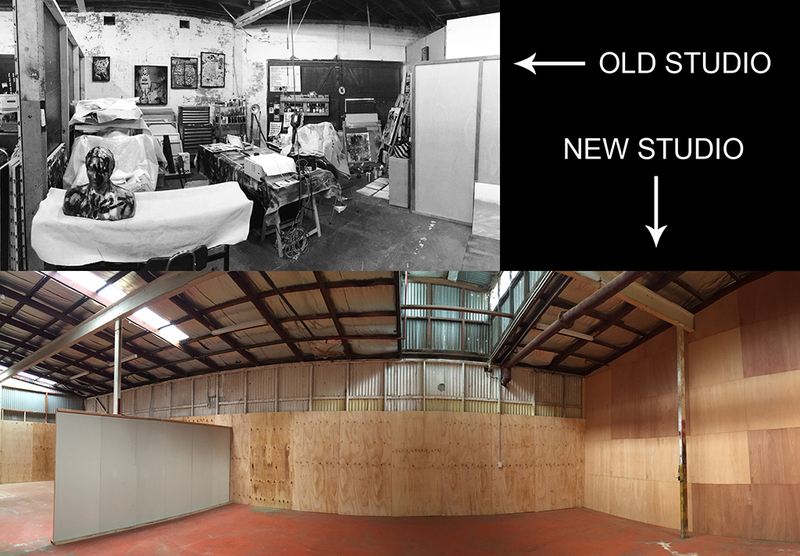 I have moved out of the Factory 21 studios into a new bigger studio…G-Cubed Studio. 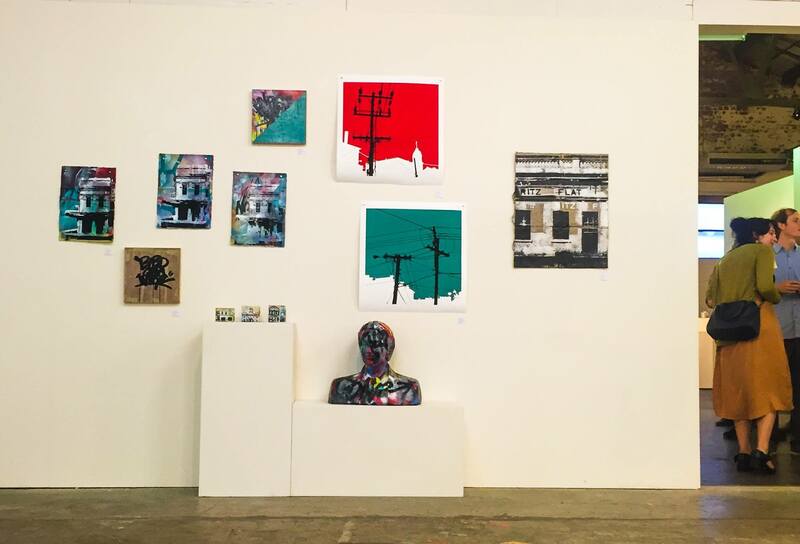 I took part in Summer Projects 2 at Boom Gallery pushing out some new graphic prints of urban scenes. I also got to show a colab I did with JoanneKemerer…being the tagged up head that she sculpted titled. ‘defaced’. 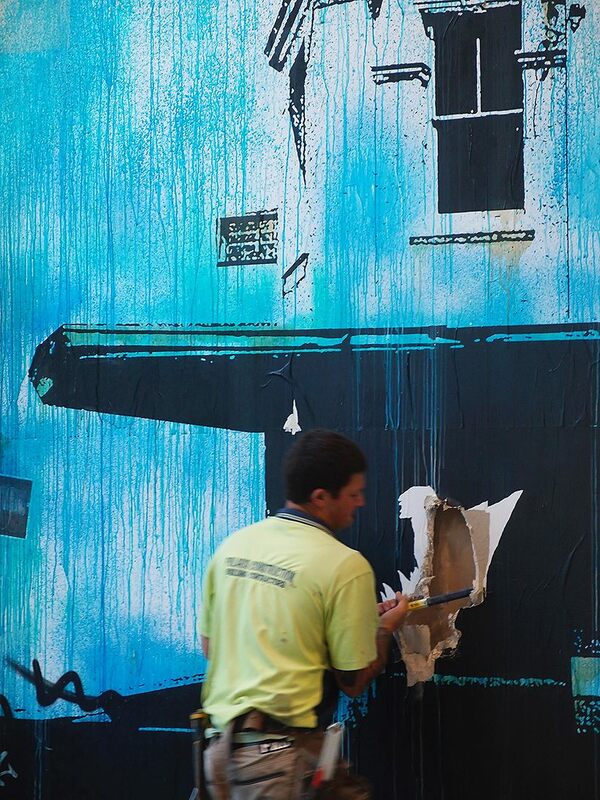 My Ritz install at the Geelong Gallery finally came down after its extension. 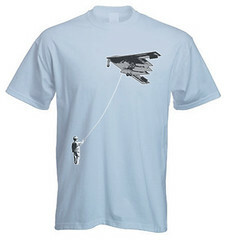 This was to mixed views…it seems people are going to miss it and wanted to see it it stay. 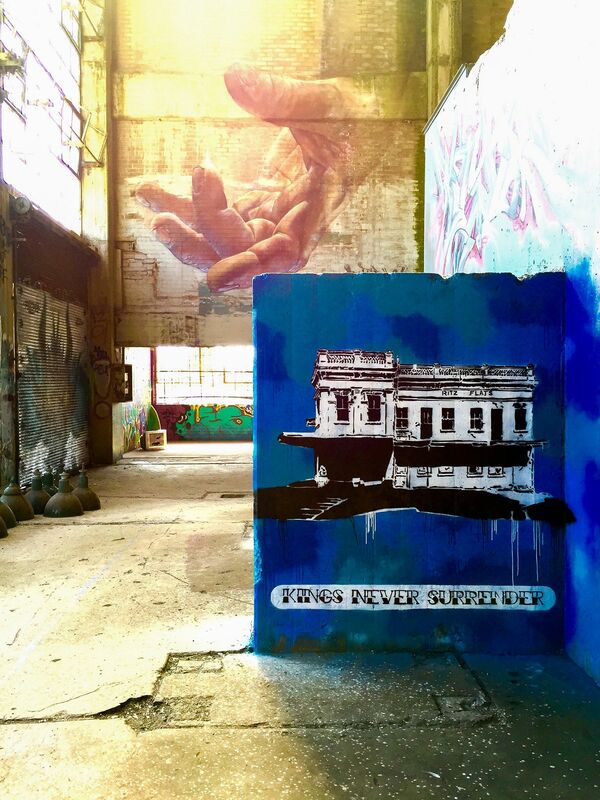 But keeping in true form with street art, it was always going to be ephemeral. What goes up must come down. Thanks Geelong Gallery for having me. 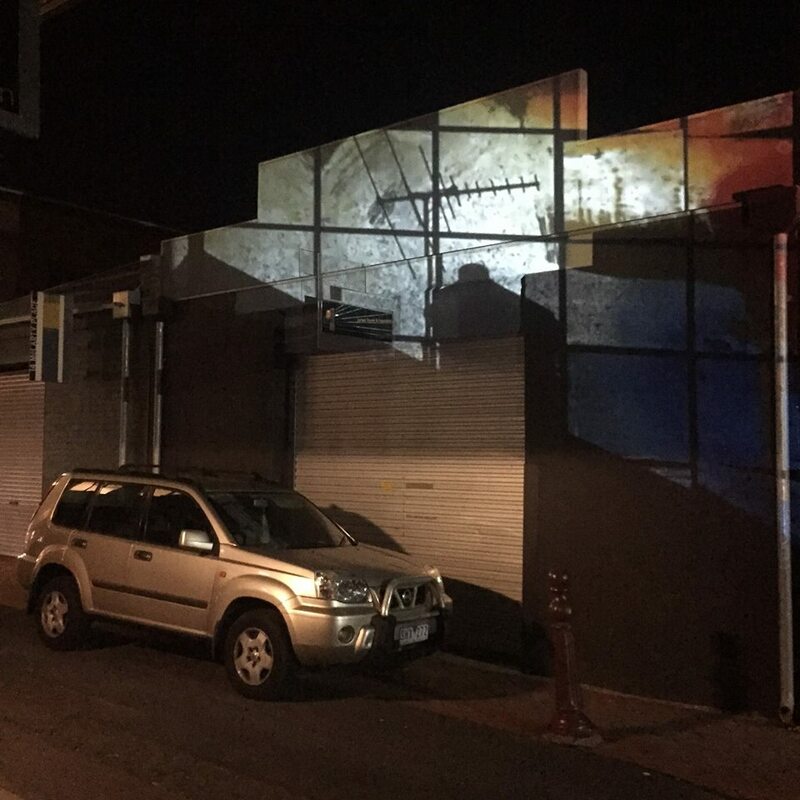 Now we are well into the year, I just took part in Geelong After Dark last week doing a projection from Oxide Gallery in McLarty Place. It was a quick project…but it went off seamlessly once set up, which is always good. Thanks to Sue for the opportunity to base myself in her gallery, and Lou for adding me to the website at short notice. Note to self…must do paperwork! 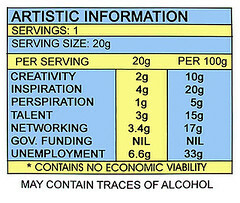 Recently, I had my artwork featured on a wine label by Livewire Wines. 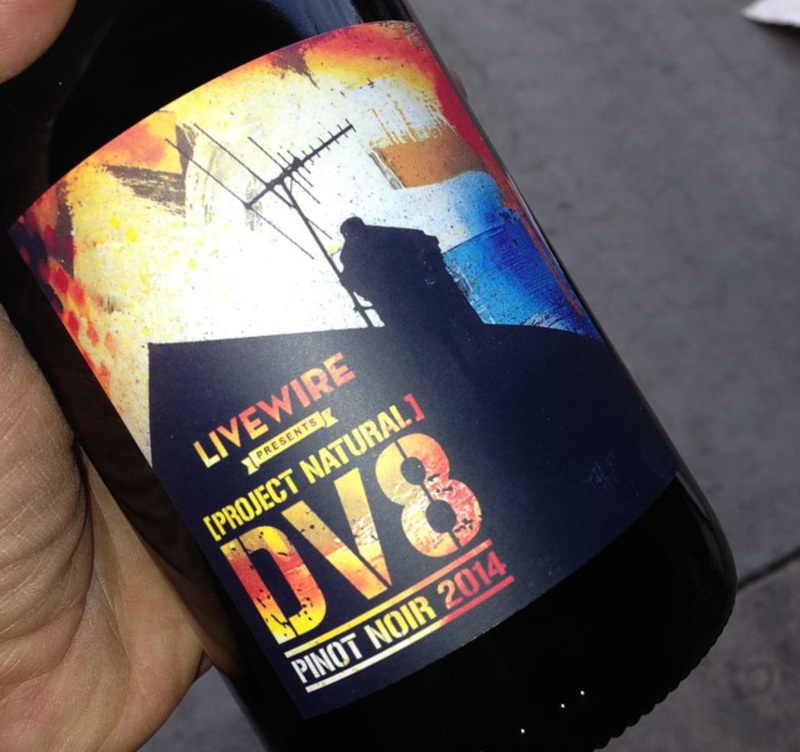 (Image pinched from their insta…Thx Livewire Wines!). Haven’t got my hands on one yet, but i have had their wines before and they are very good…and this one is largely organic with just a small amount of sulphur for bottling. So one not to be missed. I think Union Street Wine bar are stocking it locally to Gtown, or contact Anthony at Livewire directly to get your hands on it. On top of this I have some work in the next Boom Gallery exhibition…a stable group show(two solo shows opening the same night too! ), opening Friday 15/5 at 5:30…so come along if your free. I have something new and a bit different for me on show around the theme of water…and a big work too. I currently also have a few murals on the go in the background which could get the go ahead at any stage…but I will talk more once they are in real motion. So stay tuned. I have another little solo exhibition ‘Zone 1’ coming up in the Little Window of Opportunity at Port Jackson Press in the second fortnight in June(Starts on the 16th). After the last show basically sold out…yay! I got the call back. So fingers crossed it goes well again. It is an inner Melbourne focus for the work this time, with areas that I have been very familiar with over the years or lived in. And in final news…only public last week. I have been selected as one of 15 emerging artists from around the country to take part in a series of exhibition for the first Australian Print Triennial in Mildura set for October this year. This was a real honour if you go over and have a look at the line-up. So it looks like it is going to be a busy year ahead as well…while still working 5 days a week! So lets see what develops next.